Boyds Mills Press, 9781590783399, 39pp. The traumas and trials of moving away are poignantly expressed in new poems from a respected writer. Fletch's new Diamondback mountain bike and his brother's new hockey outfit are unexpected gifts from Dad. When Dad announces, "We're going to move to Ohio," Fletch's heart drops to his stomach. Leaving means selling the house, abandoning his best friends, and living next to Lake Erie. . . . Hey, didn't that lake catch on fire? 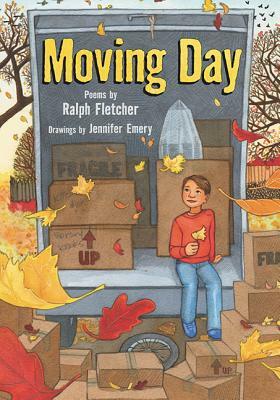 Ralph Feltcher's poems evoke what's hard about moving away as well as what makes moving day, well, maybe, okay. Ralph Fletcher works with teachers and children in schools across the United States, both as an author and a creative writing consultant. He is the author of several poetry collections, including "I Am Wings "(a School Library Journal Best Book of the Year), "Relatively Speaking: Poems About Family, "and "Have You Been to the Beach Lately? "He lives with his familyin Lee, New Hampshire. Jennifer Emery is the illustrator ofthree other Boyds Mills Press books, most recently the picture book "Animal Alphabed "by Margriet Ruurs. She lives in Minneapolis, Minnesota"